New Fiat cam belt kit and water pump. Includes 1x cam belt 1x tensioner and 1x water pump. Fiat 500L 1.4 16v fire / 500 1.4 16v fire / Abarth 500 1.4 16v Turbo. Fiat Punto Evo 1.4 16v / Fiat Punto Evo 1.4 16v. Abarth Punto Evo 1.4 16v Turbo 135hp. Fiat Punto Grande 1.4 16v / Fiat Punto Grande 1.4 16v. Abarth Fiat Punto Grande 1.4 16v Turbo. Fiat Punto MK3 1.2 16v / 1.4 16v. Fiat Punto MK2 1.2 16v. Fiat Punto MK1 1.2 16v. Fiat Panda mk2 1.4 16v 100hp. Fiat Panda MK3 1.4 16v. Fiat Bravo MK2 1.4 16v / 1.4 16v T urbo / 1.4 16v Multiair T urbo. Fiat Stilo 1.2 16v / 1.4 16v. Oe number cam kit 71736717. Oe number water pump 55221397. 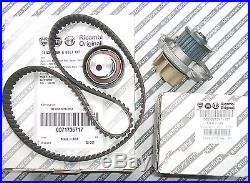 The item "FIAT 500 PUNTO PANDA STILO IDEA BRAVO 1.2 1.4 GENUINE Cam Belt Kit & Water Pump" is in sale since Wednesday, November 5, 2014. This item is in the category "Vehicle Parts & Accessories\Car Parts\Engines & Engine Parts\Other Engines & Engine Parts". The seller is "altautoparts" and is located in Huddersfield. This item can be shipped worldwide.